For some, the end of summer is bittersweet. For others, it’s welcomed with open arms. There’s so much to love about this time of year like fuzzy socks and campfires! The weather is cooler which means it’s more comfortable to get outside and mark off some of the items on your honey-do list. It’s a great time to add gutter guards before the leaves start falling, remove oil stains from the driveway and garage, inspect your windows and weather-stripping throughout the house (call the utility company if you’d like to have an energy audit! ), inspect your foundation, and ensure your locks and doors are safe and secure since you’ll likely having gifts in the house during the holidays. If you own an investment property, don’t forget to get it winterized to prevent pipes from bursting during the colder months. Side note: We have a complete list of client-recommended vendors available to help you upon request. Another reason we love this season is it’s great for doing fun things outside. You know what they say about all work and no play! This is a great time of year to visit a pumpkin patch like Tate Farms or Lyon Family Farms. Kids love getting to take a hay ride and pick out their pumpkin. Carving and decorating pumpkins are another fun event this time of year. There are tons of ideas for pumpkin carving and also decorating without using a knife like using chalkboard paint or glitter. And of course, we can’t forget about the deliciousness of the season. Food. There are all kinds of recipes we have grown to love during fall. Most of them involve fall’s star ingredient Pumpkin! And we love the transitional menu items like Pumpkin Pie and Pumpkin Bread. But there are a few interesting recipes we have found that we can’t wait to make like Pumpkin Casserole, Pumpkin Dip, Pumpkin Cobbler, and Pumpkin Donuts! 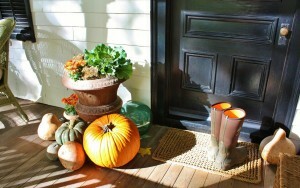 We’d love to hear a few of your favorite things about fall or your home improvement tips. Leave your comments below. And let us know if you or someone you know is looking to buy or sell a home in North Alabama. Call us at (256)799-9000 or visit us online at www.AmandaHowardRealEstate.com.